LOS ANGELES (AP) — The Calgary Flames made wholesale changes to their lineup, sitting two top forwards and four defensemen one night after winning the Pacific Division and securing home-ice advantage throughout the Western Conference playoffs. They still steamrolled the hapless Los Angeles Kings. Derek Ryan scored twice, Mark Jankowski had a goal and two assists and the Flames routed the Kings 7-2 on Monday. 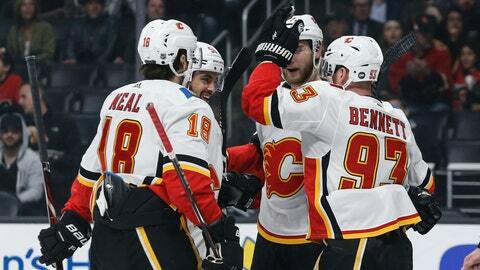 Sam Bennett, Johnny Gaudreau, James Neal and Andrew Mangiapane also scored for the Flames, who reached 50 wins for the second time in franchise history. David Rittich made 23 saves. The only other time the Flames won 50 games was in 1988-89, when they had 54 victories in the regular season before hoisting their only Stanley Cup. Ryan said this group is trying to appreciate its current success but understands what comes next is more important. Kings goalie Jonathan Quick was removed in the third period after allowing seven goals on 25 shots. Kyle Clifford and Dustin Brown scored, and Anze Kopitar had an assist in his 1,000th game. It took some time for the reconfigured Flames to find their footing. Gaudreau put them up 3-2 at 6:46 of the second period with a sharp-angle shot into the far corner, but the real barrage started 13 seconds into the third when Neal scored for a 4-2 lead. Ryan got his second goal at 2:33, and Mangiapane made it 6-2 at 8:30. Jack Campbell replaced Quick after Jankowski put the Flames ahead 7-2 at 8:45. Campbell made five saves in relief. While the Flames were focused on playing their best hockey going into the playoffs, the Kings sounded like a team finally ready to throw in the towel on a frustrating season. NOTES: Bennett, back after missing five games because of an upper-body injury, and Kings D Kurtis MacDermid did not return after both players were injured in a collision late in the second period. Flames coach Bill Peters said Bennett “dodged a bullet” and would play again in the regular season. MacDermid will not travel with the Kings for their next game, coach Willie Desjardins said. … Kings forward Ilya Kovalchuk had an assist after being a healthy scratch the previous six games. Flames: At the Anaheim Ducks on Wednesday night. Kings: At the Arizona Coyotes on Tuesday night.